• Touch the sculptures dotted around the gardens and gently caress the plants in passing, lifting their fragrance into the air. 2017 also marks the 50 year anniversary of ninth generation resident and general manager, George Buchanan’s, parents living at Hodsock Priory. 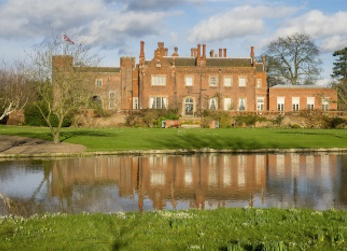 The annual opening of Hodsock Priory is a family legacy started by accident 26 years ago, when Lady Belinda Buchanan turned a previously neglected garden into a celebrated one by opening her Snowdrop gardens to the public for the first time. She was astonished by the numbers of visitors who arrived, and who returned year after year, interested in meeting the family and seeing behind closed doors. George and his father, Sir Andrew Buchanan, offer a personal touch to visitors who enjoy having a family member on site every day during the snowdrops season. Each year at Snowdrops at Hodsock, visitors enjoy the opportunity to roam five acres of formal planted gardens, landscaped in the 1820s, and a further 12 acres of stunning snowdrop and beech covered woodland. The woodland walk is suitable for all abilities with regular resting places, and footpaths throughout the woodland and gardens are passable in most weather conditions with wheelchairs and buggies. The gift and plant sale area run by locally-based Floral Media will be located aside Hodsock’s iconic Tudor Gatehouse again, with direct access into the Snowdrop woods. Each day, the campfire will be lit in the Glade where picnics can be eaten, or hot drinks and snacks bought from the Woodland Cafe. A free, fun and informative history talk takes place by the campfire at around 2pm each day. For full details see www.snowdrops.co.uk email info@snowdrops.co.uk or call 01909 591 204.